Notes: This tour itinerary book was used by members of the touring crew for the first part of the Protection tour which covered the first UK and European dates. Details covered in the itinerary book include such things as list of dates/venues, hotels booked for different touring cities, flight plans between cities and phone numbers of all the lost important touring personnel. 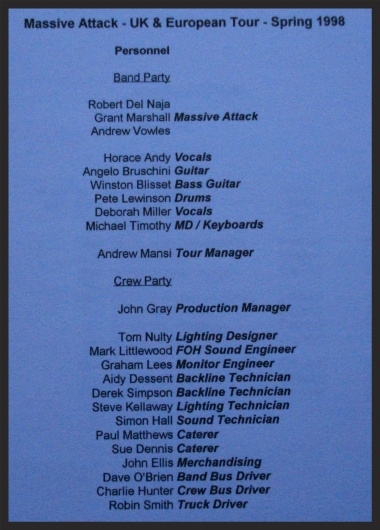 Notes: This tour itinerary book was used by members of the touring crew for the first part of the Mezzanine tour which covered the first UK and European dates. Details covered in the itinerary book include such things as list of dates/venues, hotels booked for different touring cities, flight plans between cities and phone numbers of all the lost important touring personnel. 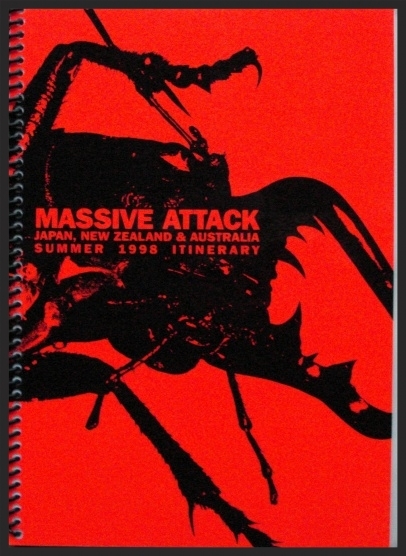 Notes: This tour itinerary book was used by members of the touring crew for the second part of the Mezzanine tour which covered the Japan, New Zealand and Australia, which were also the first dates Massive attack had ever played in these countries. Details covered in the itinerary book include such things as list of dates/venues, hotels booked for different touring cities, flight plans between cities and phone numbers of all the lost important touring personnel. 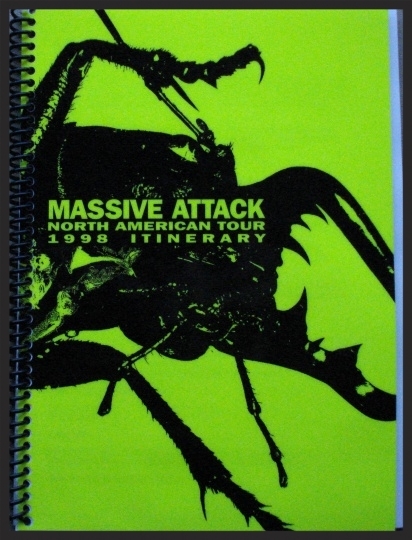 Notes: This tour itinerary book was used by members of the touring crew for the third part of the Mezzanine tour which covered the North American dates. Details covered in the itinerary book include such things as list of dates/venues, hotels booked for different touring cities, flight plans between cities and phone numbers of all the lost important touring personnel. Notes: This tour itinerary book was used by members of the touring crew for the fourth part of the Mezzanine tour which covered the South African dates. Details covered in the itinerary book include such things as list of dates/venues, hotels booked for different touring cities, flight plans between cities and phone numbers of all the lost important touring personnel. 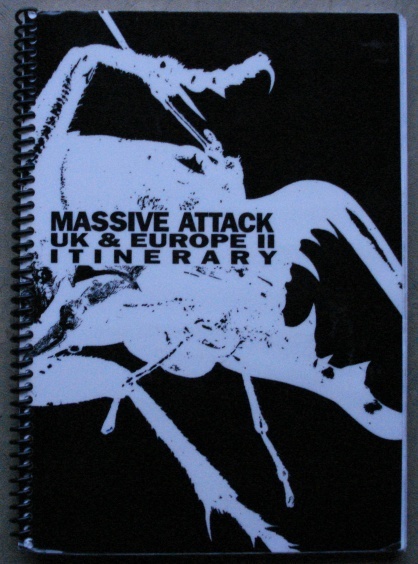 Notes: This tour itinerary book was used by members of the touring crew for the fifth and last part of the Mezzanine 1998 tour which covered the UK and European dates as Massive Attack choose to return to the continent to finish up their tour at the end of year. Details covered in the itinerary book include such things as list of dates/venues, hotels booked for different touring cities, flight plans between cities and phone numbers of all the lost important touring personnel. Notes: This tour itinerary book was used by members of the touring crew for the first part of the 100th Window tour from April to June 2003. Details covered in the itinerary book include such things as list of dates/venues, hotels booked for different touring cities, flight plans between cities and phone numbers of all the lost important touring personnel. Notes: This tour itinerary book was used by members of the touring crew for the second part of the 100th Window tour from June to August 2003. Details covered in the itinerary book include such things as list of dates/venues, hotels booked for different touring cities, flight plans between cities and phone numbers of all the lost important touring personnel.